Lovely flowers, beautiful colors, great photos, as always! Gorgeous flowers. I love 13s full of beauty. I've seen them many times before; didn't know they were called pastel roses. I lvoe the name. They're also pretty. Happy T13! Wow, what beautiful flowers! So lovely. Thanks for the visual treat. Beautiful pastels! Thanks for sharing. Happy TT! The colors are gorgeous! Happy T13! these flowers are soo beautiful. These are gorgeous. I really enjoy your TTs. So colourful! The rises make a lovely collage! Ahh, those are lovely in the soothing way. Where you want to sit and stare and feel the zen. Lovely. I often wish I had more flowers here in the desert to enjoy and photo. The roses are just beautiful and I love, love, love the Russell quote! These are all from your garden, right? You do have an impressive garden. 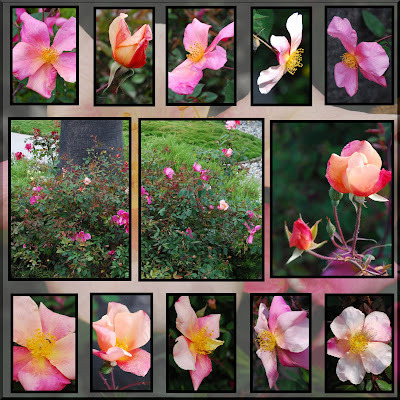 I like how you presented your collage of the flowers, depicting its life from a budding rose to almost the end of the petals. Have a great day!